G1000® NXi is equipped from the factory on many new aircraft. It's also available as an upgrade in select aircraft equipped with the original G1000. Our next-generation G1000 NXi system takes the industry’s most trusted glass flight deck platform to a new higher level of performance and capability. It combines added processing power with brighter, smoother high-resolution displays, advanced features and built-in growth provisions — offering a clear path for OEMs and qualified engineering facilities to design, install and certify the “best and brightest” in integrated systems for their aircraft. To highlight the advantages you’ll see from the cockpit, let’s walk through a pilot’s typical first-flight experience with G1000 NXi. From a physical standpoint, the NXi displays look very similar to the earlier-generation G1000 versions you’re familiar with. But if you look “under the hood,” you’ll see that the display technology has been significantly upgraded. By going from single- to dual-core processors, we’ve dramatically boosted the system’s speed, power and capacity for future growth. You can see the difference in the NXi system’s robust graphics rendering and map updating — with its much faster zooming, panning and redrawing speeds. You’ll also note a whole array of new, enhanced operational features and capabilities, including our latest SurfaceWatch™ runway identification and alerting technology¹, Connext wireless cockpit connectivity¹, HSI mapping on your primary flight display, animated NEXRAD datalink weather¹, autopilot-coupled visual approaches down to pilot-selectable minimums and much more. With excellent dimming performance from the most modern LED backlighting technology, the displays are bright, crisp and adaptable to a broad range of aircraft models. 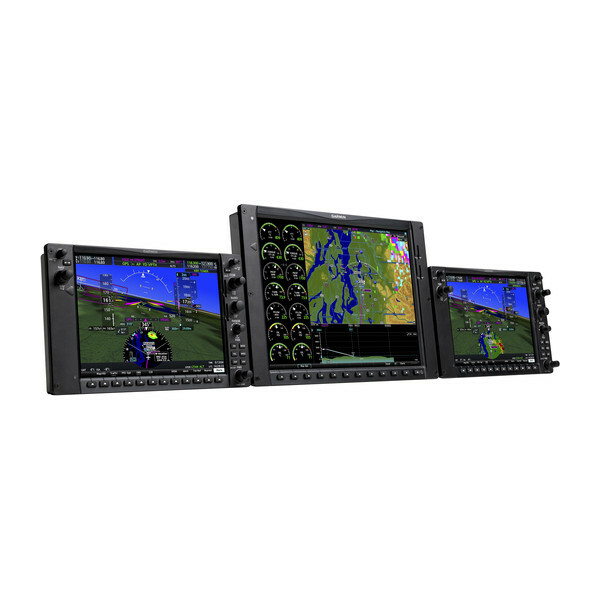 Like the legacy G1000 displays, the NXi units can be configured as 2-display or 3-display systems in the aircraft, with available 10” or 12” flat-panel LCDs interchangeable for use as either primary flight displays (PFDs) or multifunction displays (MFDs). An optional 15” screen is also available for even larger format MFD configurations. G1000 NXi’s ability to simplify and streamline your piloting workload starts even before you climb into the cockpit. With the addition of an optional Flight Stream 510 wireless gateway, your G1000 NXi system becomes capable of streaming information in real time between your avionics and compatible mobile devices running the Garmin Pilot™ or ForeFlight Mobile apps. This means you can do advance flight planning on your iPad® tablet or other smart device — in the comfort of your home or office — and then wirelessly load the data into your avionics once you get to the airport. The night before your flight, you can check the weather, plan your route and file your flight plan — all from your tablet or smartphone. You can also check to see if there are any database updates for your avionics that you need to download. Then, you simply collect all that information on your mobile device — and use it to transfer the data to your avionics when you get to the airport the next day. Arriving at your aircraft with iPad in hand, your preflight preparations go quickly. You turn on the master switch, and the NXi displays initialize within seconds — so you can quickly boot up and access your avionics. You check the ATIS frequency — which is automatically identified — for airport departure information. You check Garmin Pilot on your iPad to see if you’ve received any modifications to your flight planned routing that you need to enter. Then you simply upload all the flight plan waypoints and procedures from your iPad to your avionics. If you have any database updates to load, your wireless Database Concierge connection enabled by Flight Stream 510 can automatically upload and sync those transfers with all your displays while you’re outside doing your preflight walk-around inspection. This app-to-avionics interface really saves you time and tedious data entry — so you can complete your checklist items quicker and get airborne sooner. As you call for your taxi clearance, you check your MFD airport diagram for current taxiway and runway traffic. With G1000 NXi, we’ve expanded the suite of Garmin Terminal Safety Solutions that began with SafeTaxi® diagrams and TerminalTraffic™ surveillance of ADS-B equipped planes and vehicles operating within the airport environment. The latest element is SurfaceWatch. This is an optionally available feature designed to further support safe on-airport operations by helping pilots avoid runway incursions or other miscues such as taking off or landing on the wrong runway. Or on a taxiway. It even tells you if you’re lined up on a runway that appears to be too short for safe takeoff or landing. Also, SurfaceWatch can optionally provide runway distance-remaining annunciations, beginning at 5,000’ down through 500’ remaining. With your taxi to the run-up area completed — and the proper runway alignment confirmed by SurfaceWatch — you’re ready to call for takeoff clearance and get rolling. Lined up on the centerline, you apply power and quickly get airborne. Once established on climbout, you can really begin to see the benefit of the HSI mapping feature on the G1000 NXi system’s primary flight display. This enables an MFD-like perspective map view to be displayed right in your primary field of view within the HSI portion of the display in front of you. The detailed graphical landscape helps focus your instrument scan — while allowing you to view mapping, terrain, obstacles, traffic, weather overlays, navaids, airport diagrams and more. It’s a great aid for pilot situational awareness, especially when things get extra busy in the cockpit. In addition to the geographical map overlay within the HSI, our SVT™ synthetic vision technology is also optionally available with G1000 NXi. Using sophisticated graphics modeling, this technology recreates a 3-D “virtual reality” database landscape with similar terrain, obstacles, flight plan routes, weather, airports and other details displayed on the upper portion of your PFD. Also, there’s a useful projection of the aircraft’s flight path, indicated by a flight path marker (FPM) on the SVT display, which shows the calculated effect of variables such as attitude, airspeed, wind vectors, etc. on the aircraft’s trajectory across the ground. It’s a valuable tool to have when you’re trying to gauge a possible conflict with terrain or obstacles near your flight path. It’s also very useful in targeting the runway threshold on approach, particularly when you’re correcting for crosswinds or low-level turbulence. As you cruise along with the available GFC™ 700 autopilot tracking your flight-planned route via inputs from the NXi’s robust GPS navigation system, you have plenty of inflight information to work with. In addition to flight director command bar cues and modes, the GFC system also supports an impressive array of high-end flight control features¹, including vertical navigation, coupled go-arounds, Garmin ESP™ (Electronic Stability and Protection1), underspeed protection (USP), flight level change (FLC) and more. Any pilot who’s ever been startled to attention by a stall warning horn in a busy cockpit will appreciate the proactive stability augmentation of our ESP monitoring technology. This feature functions independently of the autopilot system — although it uses the same control servos — to gently nudge the controls toward stable flight whenever pitch, roll or high-speed deviations exceed the recommended limits when the aircraft is being hand-flown. It helps prevent loss of control should disorientation or incapacity occur during flight. To assure you’re aware of changing weather conditions en route, G1000 NXi supports a variety of satellite datalink options — showing you animated NEXRAD imagery, current airport conditions, forecasts, precipitation, lightning, winds and more. Both the U.S. sourced ADS-B network and SiriusXM® satellite weather services¹ can be accessed from your system (SiriusXM subscription and optional hardware required). Plus, an optional Connext satellite link receiver can also bring seamless on-demand worldwide weather information to your cockpit for international operations. For tactical onboard weather avoidance, the available GWX™ 70 Doppler-capable digital radar¹ puts a wealth of technology at your fingertips. Its full-color storm cell imagery can be overlaid on your MFD’s moving map — as well as on your PFD’s HSI map display. To help you keep an eye peeled for traffic, the G1000 NXi system supports ADS-B “Out” and “In” functions for network-based surveillance that includes our patented TargetTrend relative motion technology. This offers you a faster, more intuitive way of judging target trajectories and closure rates relative to your aircraft's flight path. For even more capability, you can also choose from a range of TCAS I and TCAS II active traffic systems¹. For onscreen map and chart navigation, the NXi system’s dynamic moving map display on the MFD can also be supplemented with georeferenced VFR sectional and IFR en route chart displays as well as electronic approach plates and previews of standard airport departure and arrival procedures. You can also opt to load both FliteCharts® and Jeppesen® format ChartView™ plates on the NXi system, and then alternate between them any time during your flight. As you near your destination, the G1000 NXi system works to streamline and simplify your transition into busy terminal airspace. If ATC calls to update your arrival route, it’s helpful to have the instant replay feature on your audio control panel. It automatically captures incoming comm audio so you can replay anything you’ve missed. In preparing to make your descent, the G1000 NXi system gives you a clear picture of your horizontal and vertical flight situation at a glance. Using information from its terrain and U.S. obstacles databases, your NXi displays offer color-coded terrain contouring to graphically alert you if any proximity conflicts loom ahead. Three-color terrain shading — an enhancement introduced with the NXi series — incorporates green, yellow and red contouring to depict when your aircraft is 2,000’, 1,000’ and 100’ feet above the surface. For added context, a vertical situation display (VSD) on the MFD provides a georeferenced profile view, which looks much like the bottom portion of your approach plate, to show your descent in relation to nearby topography — as well as to your active flight plan. With WAAS GPS-based guidance from the NXi system, your GFC autopilot can fly everything from coupled holding patterns to curved-path radius-to-fix (RF) leg types to all kinds of precision and nonprecision approaches plus coupled go-arounds. Full Class 3 approach capability lets you fly GPS-only LPV “glidepaths” down to ILS-comparable minimums at thousands of runways, which may not be served by ground-based electronic approach aids. Plus, the NXi series goes even further by adding Visual Approach capability. With this, your system can generate a 3-degree autopilot-coupled vertical flight path down to pilot-selectable minimums to most runways. You can also select vectors or straight-in for the final approach intercept — giving you even more options for accessing the widest possible variety of airfields. As you continue through the landing procedure, our SurfaceWatch alerting technology once again helps to ensure you’re not mistakenly lined up on an unassigned runway. Or, worse yet, on a taxiway. As you land smoothly and taxi off the active runway, our georeferenced SafeTaxi diagrams help you stay oriented if you’re not familiar with the airport layout. You navigate the taxiways, pull to a stop on your destination ramp, and begin clicking through your shutdown checklist. Meanwhile, your NXi system’s built-in Flight Data Logging feature is automatically storing all critical flight and engine parameters on an SD™ data card, which your service crew can use to analyze trend information and spot early signs of potential service issues to avoid more costly repairs later. With its extensive features and advanced technology, it’s easy to see why G1000 NXi is the ideal flight deck solution for your aircraft. Backed by our top-ranked Garmin product support team, you can count on these growth-oriented displays to keep pace with evolving technology and airspace requirements.